1. Soap and loofah for cleaning up your dirty Halloween shenanigans. Not those shenanigans 😉 . 2. Tacky travelers you won't have to travel farther than a click on a link to get. Promising Review: "Great costume! My boyfriend and I were a hit at our Halloween party. It's comfortable and easy to wear. What we loved was that you can add so many different accessories to make this costume even better." —Jen P.
4. Peanut butter and jelly for a nutty good time. 5. King and Queen of Hearts because you know you're the king and/or queen of your significant other's heart so this will be fitting. 7. Alex and Piper costumes sure to help you and your loved one become the winners of Litchfield, or the costume party. 8. A toothfairy and a tooth so you can shine brighter than some beautiful pearly whites. 9. Popeye and Olive Oyl because every couple should dress as this famous pairing at least once. Don't forget the spinach! 10. Hot dog and bun for those who don't want a couple costume unless it's got buns, hun. 11. Adam and Eve — it'll definitely get you the most original costume award. 12. Wine and cheese sure to have you saying "yes, please." 13. Puzzle pieces so everyone knows you two fit like two pieces of a puzzle. 14. 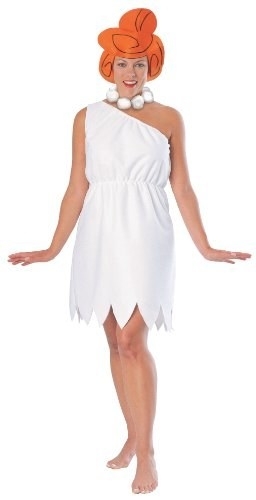 Fred and Wilma Flintstone to send you back in time to the Stone Age. 15. Bacon and eggs for those who know breakfast is the most important meal of the day, and Halloween is the most important day of the year. So, whatcha going to be?